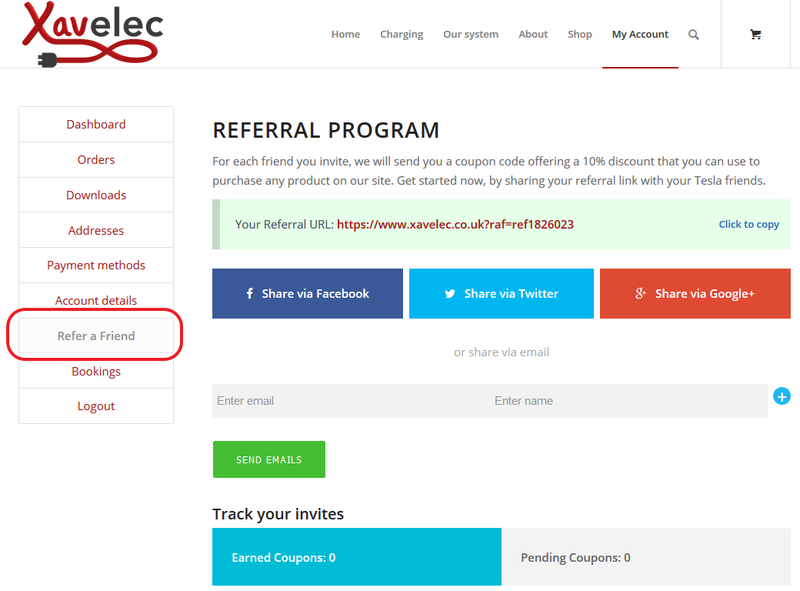 Here, you’ll find details on the Xavelec referral scheme and partnership referrals with other Tesla-related items you might want to look into. We’ll also list any special offers we have on currently, so is subject to change on a frequent basis. Not only that, but the referred person will also receive a 10% discount for future subsequent purchases. Everyone has a unique referral ID / URL. You can share this with people, on social media, etc. This code starts with “ref” and can offer up to 10% discount. Once your friend completes their order using your referral, you will obtain a “raf-xxxxx” coupon code providing up to 25% discount. Your referred friend will also receive a coupon they can use on future purchases. To view your referral status: navigate to your account by clicking on the “My Account” link at the top right of the site. Log in if you’re haven’t done so already. From there, you can share to social media or simply copy the URL and paste it into emails. There’s a handy email sharing function in place too. Each referral gives you a 25% discount coupon code. Currently, there is no minimum spend nor order value. Pending Coupons shows the number of referred people where orders are still subject to completion. Earned Coupons shows the number of successful referrals (completed orders). A table below will list the name of referred friends as well as the date and status. The 25% and 10% discount codes cannot be combined with any other offer. Each coupon code can only be used once. Whilst we encourage you to share your enthusiasm for our cables and adaptors, please be considerate when sharing your referral code and don’t spam TOGUK or other social media platforms. We’ll honour coupon codes as long as they are fair use. Xavelec reserves the right to void any orders where there has been clear abuse of the system. O&H offers fine, luxury luggage that’s tailored to fit the frunk and boot of your Model S and X (and 3). Having bought a set myself, I can vouch for the quality and fitting and find the bags remarkably useful as you can load in the comfort of your home and then transfer to your car with minimal effort and time. As well as the fine luggage, O&H makes fine shoes that are super comfy and well adapted to driving. Styled and inspired by the Tesla design, there are no better Tesla driving shoes available.